With more than 278,000 followers on Facebook, Hungary’s Two-Tailed Dog Party was the the most popular party on social media to stand in the country’s 2018 election. However, its online popularity did not help win seats in the vote which delivered Viktor Orbán a third term as prime minister by a landslide. In an anti-establishment approach, the Dogs’ campaign was carried out entirely by volunteers and official campaign funds were used to support community projects. Despite only coming away with 1.71% of the votes, however, the party has pushed an important boundary in Hungarian politics. The Two-Tailed Dog Party was founded in 2006, although formal recognition didn’t come until 2014. It defined itself as a joke party from the start, becoming famous for making fun of other political groups – mainly the mainstream Fidesz, led by Orbán. Its activities range from street art to graffiti to urban gardening. It even smuggles soap and toilet paper into hospitals in order to highlight the dire state of some healthcare facilities. 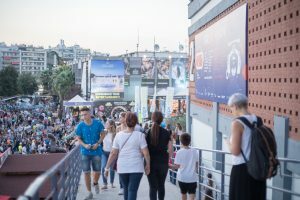 In 2016, the party crowdfunded €100,000 to cover the country in satirical posters mocking the government’s call to vote against EU refugee quotas in an impending referendum. Then in 2018, just a couple of weeks before the deadline, the party managed to get enough signatures to be able to participate in the national parliamentary elections. The jokers were getting serious. 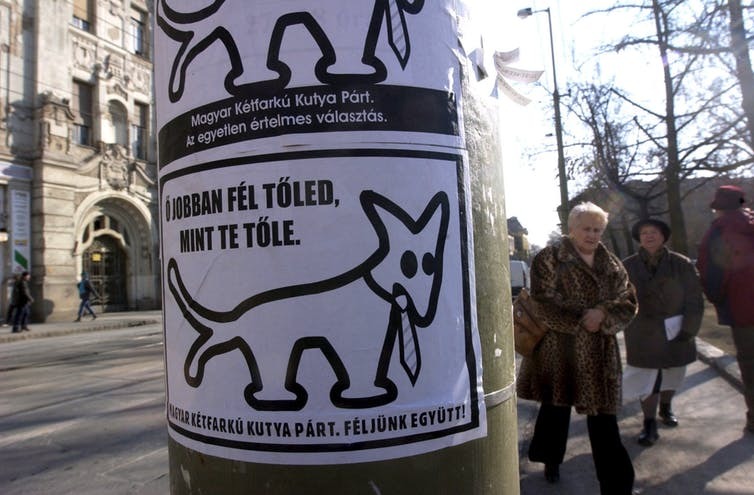 A Two-Tailed Dog sticker appears on a Budapest lamp post. All political parties use emotions to persuade people to vote for them. The Two-Tailed Dog party and its kind are trying to undermine establishment organisations by turning humour into political action. In a process social scientists call “kynicism”, the Two-Tailed Dog party borrowed and remixed government messages for its own aims. The idea is to mock the government’s rhetoric in order to disperse fear and anxiety. In Hungary, it’s unclear what the future holds for the Two-Tailed Dog party, or these joke parties more broadly. There is a fundamental mismatch between the way everyday politics works and the vision of the party. I can’t really tell how many of our Facebook fans would vote for us … To be honest, for me the parliamentary elections are not important. For me, it’s much more important to see what we can do … I have to confess: my aim is to create something creative and funny, and yet meaningful … I think it is useless to have one more opposition party that has a serious programme. I have no interest to do politics in the traditional way. 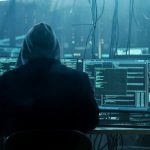 If the case of Iceland’s Pirate party shows us anything, it is that parties like the Two-Tailed Dog have a tendency to lose their edge once they gain political influence. In 2016 the pirates topped opinion polls, and seemed to become a real political force by winning ten seats in the parliament. However, in the latest elections, they won only six seats. Alternative parties, like the Two-Tailed Dog exist to mock from outside the mainstream. But what’s the point of a political party if it doesn’t really want to get elected and to introduce its policies? For now, that’s not a question the Two-Tailed dogs need to answer, since they failed to make it into parliament. But the group has nonetheless radically re-energised young people. It has tested the limits of convention in Hungary’s political process. Kovács told us that when it comes to larger campaigns, “two thirds, or three quarters, of our ideas come from the people … For instance, we write an economic programme, post it to Facebook and in a couple of minutes, there are three to four better ideas in the comments, so we take it down and add these ideas. So, in fact it really comes from the people”. The next step is for the group to translate those likes on social media into actual votes. 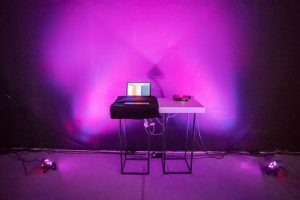 Do you want to know more about our fourth call for project proposals? Are you looking for project partners or do you have a project idea to share? Would you like to network and build new contacts? Then join the Interreg Europe team on Friday 13 April 2018 at 10am (Paris time) a two-hour online event dedicated to networking, partner search, and information about their new project call. The event is fully online, so you can participate from wherever you are. The event will be streamed live on the #europecooperates website as well as on Facebook. Furthermore, you can start sharing your ideas and send them your questions already before the event. 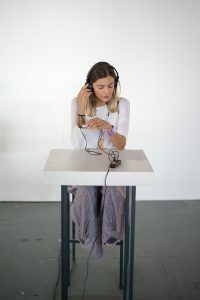 To help you connect with the other participants, they will open the online chat rooms on Wednesday 11 April, two days ahead of the live stream. See the programme for more information, register now and get ready to network! The Interreg Europe team is looking forward to seeing you online! 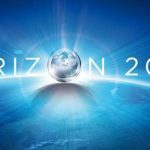 The Department for Business, Energy and Industrial Strategy (BEIS) has released the report: UK Participation in Horizon 2020, based on the EU/UK Joint Report published on 8 December 2017. 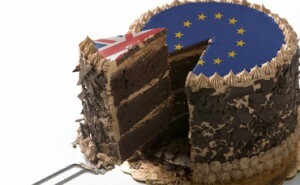 ● Until our departure from the EU, we remain a Member State, with all the rights and obligations that entails. This means that UK entities are eligible to participate in all aspects of the Horizon 2020 programme while we remain a member of the EU. 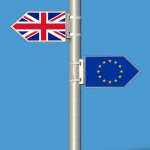 ● The UK and the EU fully intend UK entities’ eligibility in Horizon 2020 to remain unchanged for the duration of the programme, as set out in the Joint Report. 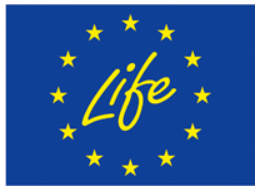 This includes eligibility to participate in all Horizon 2020 projects and to receive Horizon 2020 funding for the lifetime of projects. ● The Government’s underwrite guarantee remains in place in the event that commitments made in the Joint Report are not met. This report also considers the UK’s involvement in the next Framework Programme, the Underwrite Guarantee and mobility of researchers in the Q&A section. 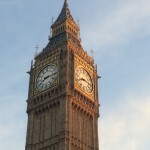 The UK Research Office (UKRO), to which BU subscribes, worked closely with BEIS in the preparation of this report and is updating their own FAQs and related documents. If you have not already registered to access their services and to receive UKRO announcements, you are encouraged to do so, to keep fully up to date with developments. UKRO also invites queries and comments from subscribers, as these are vital to inform the development of future guidance. If you are considering developing your international research portfolio, please contact your faculty’s research facilitator. Over the Festive Season the International Journal of Childbirth published the latest article from staff based at the Centre for Midwifery, Maternal & Perinatal Health (CMMPH) . 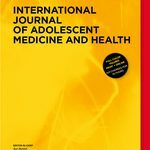 This paper ‘Women, Midwives, and a Medical Model of Maternity Care in Switzerland’ is co-authored with Bournemouth University Visiting Faculty Ans Luyben (a Dutch midwife working in Switzerland), Sue Brailey from the School of Health & Education at Middlesex University and Lucy Firth at the University of Liverpool. 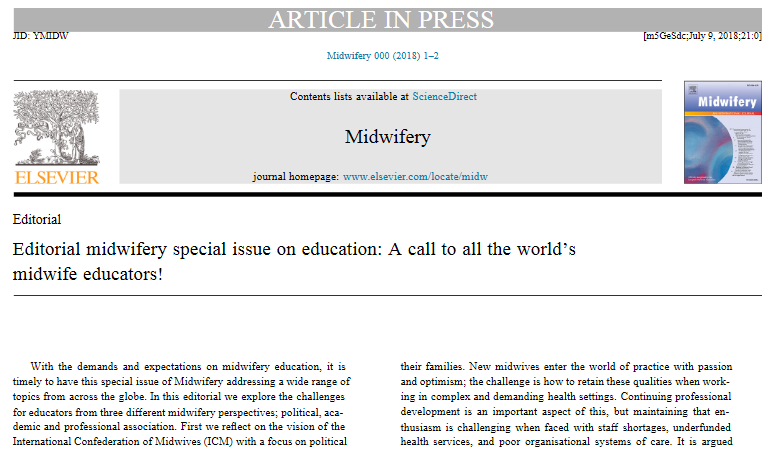 This Swiss paper builds on a body of work within CMMPH around a medical/social model of childbirth. BU academics have applied this model in multidisciplinary studies, including the disciplines of midwifery, [2-4] sociology,  and media studies . 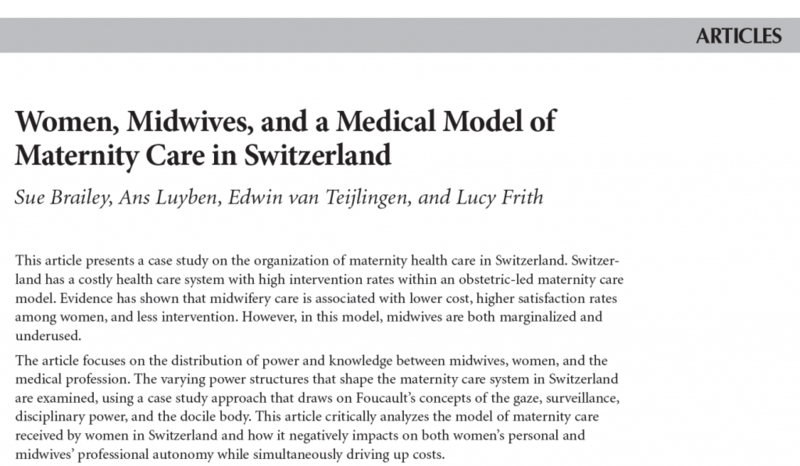 Brailey, S., Luyben, A., Firth, L., van Teijlingen, E. (2017) Women, midwives and a medical model of maternity care in Switzerland, International Journal of Childbirth 7(3): 117-125. Ireland, J., van Teijlingen, E. (2013) Normal birth: social-medical model, The Practising Midwife 16 (11): 17-20. Innovate UK and the Knowledge Transfer Network are hosting the Horizon 2020 Societal Challenge 2 event (Food security, sustainable agriculture and forestry, marine, maritime and inland water research and the bioeconomy) which is aimed at supporting collaboration across the UK and Europe. 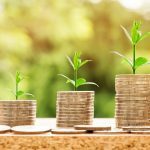 They will be promoting funding opportunities available for food security, sustainable agriculture and forestry, marine, maritime and inland water research and the bioeconomy through Horizon 2020, the EU’s largest research and innovation funding programme, with over 1 billion Euros earmarked for calls in 2018-2020. 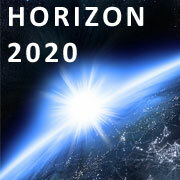 Find out more about the development of the Horizon 2020 work programme. The pre-publication draft of the SC2 2018-2020 Work Programme is already available, prior to final publication which is due at the end of October. 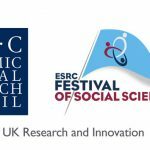 BU staff considering applying for this and other international funding calls, should contact Emily Cieciura, RKEO’s Research Facilitator for EU & International Funding for further information and support. There will be a H2020 Health, Demographic + Well-being – Match and Info Day on Tuesday, 7th November at Cardiff City Hall. If you would like to attend, please register for the event now as bookings close next week. You can also sign up to the related brokerage events, but must be registered to attend the main event to do so. The pre-publication draft of the SC1 2018-2020 Work Programme is already available, prior to final publication which is due at the end of October. This was my very first time on an exciting International Staff Training Week, hosted by Kristianstad University in Sweden. The 4 day training programme from 8 to 11 May 2017 was divided into Groups reflecting the professional service areas of: (A) Student Services, (B) Library, (C) Information Technology, (D) Finance and (E) Research & Innovation. The Week was attended by 40 participants from Universities all over Europe (Germany, Spain, Portugal, France, Romania, Poland, Hungary, Czech Republic, Turkey), of which three, besides for myself, were from the UK (Durham, Staffordshire). 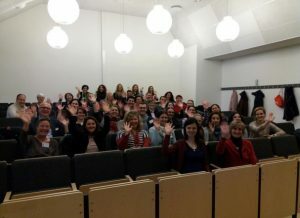 On the first day, the Host via their International Office’s staff introduced themselves to the cohort, including the history of Kristianstad as formerly a military town with the University grounds and buildings being infantry premises. The Host was a young University, initially offering nursing and teaching courses, but has now expanded to offer many more, such as agriculture, food sciences and engineering. It has this year become the most popular University for school-leavers in Sweden. After this introduction, the Host’s Vice-Chancellor welcomed us. 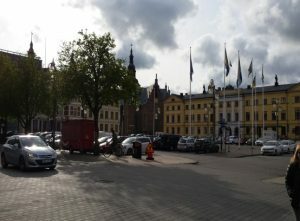 We were given brief introductions of all participants, elements of Swedish culture such as a fikka (coffee/tea break with snacks, usually delectable Scandinavian pastries), a campus tour and then a tour of the town. On the second and third days, we split into our Groups. I was in Group E – the Research & Innovation Group, which had 9 participants, of which 3 officers were from the Host and the others were from Universities in Germany, Romania, Portugal, Turkey and the UK (Durham). We all gave presentations about our Universities and engaged in intensive workshops about the issues, challenges and possible solutions to engage students and academics in research/innovation. We were taken on excursions to visit the Kristianstad Krinova Incubator Science Park and two knowledge exchange business projects – an innovative Swedish fusion food restaurant, Sotnosen’s and a sustainable aquaculture farm, Gardsfisk. We attended a one hour crash course in Swedish and emerged feeling we could say the common niceties like “hej” (hello) and “tak” (thank you). 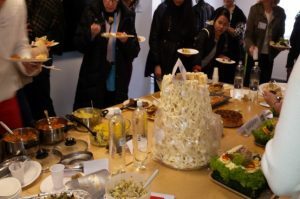 The Host invited the cohort to a welcome lunch at Metropol, their campus food hall on the first day and a finger-food lunch prepared by their international students on the second day. At this lunch, I discovered my new-found Swedish favourite – the smogastarte and a traditional sweet – the Spettekaka. We were all taken out by the Host to a smorgasboard dinner at Aptit, a restaurant in town that second evening when we had sparkling conversations about Swedish arts and culture. On the fourth day, we gathered back as a cohort and had a wrap-up session on what each Group had learned and what we would take back to our respective Universities. We exchanged contacts and raised ideas of possible future collaborations. I had a great experience meeting new people working in similar professional service areas and engaging in Swedish culture and history. I will be taking back a few practice ideas that will continue to feed into Bournemouth University’s internationalisation and innovative partnerships journey. Following the successful visit by UK Interreg Territorial Facilitators to BU on 21st February 2017, please find out more about the current Interreg call, which is open from 1 March until 30 June 2017. Support is available on the call website, including instructional videos, partner search, online project self-assessment, project feedback before submission and a demo of the application form. T2S is a new funding programme for international, transdisciplinary projects addressing transformations to sustainability initiated by the Belmont Forum and NORFACE (New Opportunities for Research Funding Agency Co-operation in Europe) network. 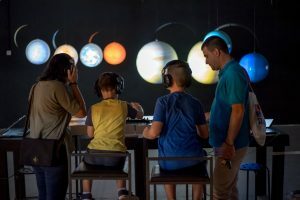 The programme is supported by funding agencies from Belgium, Brazil, Chinese Taipei, Finland, France, Germany, Ireland, Japan, Luxembourg, the Netherlands, Slovenia, Sweden, Switzerland, the UK and the USA. More information on the participation of Norway will be available soon. Support from the European Union’s Horizon 2020 research and innovation programme may also be available for this programme. The call for outline proposals is expected to launch in December 2016. 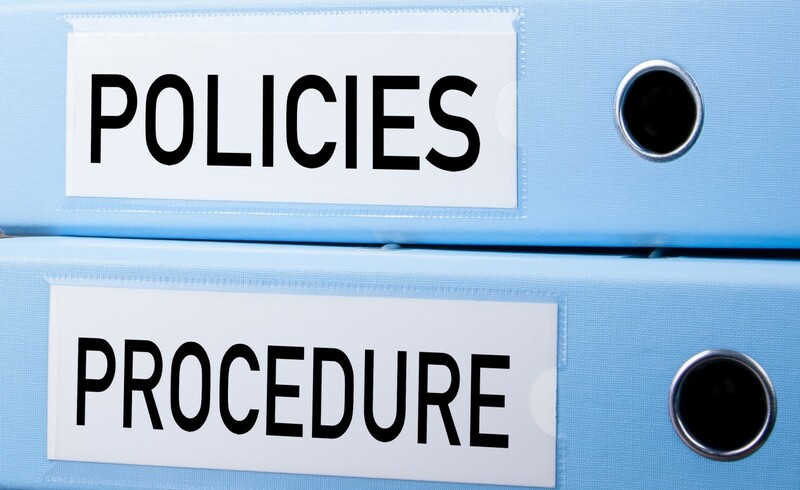 Read more on the funder’s website, where the outline application rules are are given. If you are thinking of applying for EU funding in the coming year, you need to be at this event! This session will be delivered by the UK Research Office’s BU account manager, Maribel Glogowski. The annual visit with take place from 11:30am – 15:15pm in The Octagon, Sir Michael Cobham Library on Talbot Campus on Tuesday, 25th of October. Lunch is provided. This event has been developed with UKRO to include up to date information about EU funding relevant to BU’s current and future bidding activities. Maribel is based in Brussels, along with the rest of the UKRO team, so is BU’s perfect partner for keeping us up to date with funding developments in the EU. Please book your place via Organisational Development. Spaces are filling up quickly and we need to confirm final numbers for catering this week.